B and I have traveled some 530 miles west from Cape Cod, a sixth of the way across the country . . . and yet we're still on what most people regard as the East Coast. But I'm sure you only need one guess to figure out where we are now. It's my daughter, who is having her bridal shower in Buffalo, a place where she lived for two years and where she met her fiance. B has already married off her two sons (and even has a grandchild!) but this is a first for me. So since you all have more experience at this than I have, I'd like to solicit some advice . . . but that's for my next post. For now, I'm enjoying the sights and sounds of an old city that is getting some new life breathed into it. There are two big colleges here, the University of Buffalo and Buffalo State. There are a lot of young people around. And the state is building a big new medical complex here to help revitalize the city. Meantime, we're staying in an old mental institution that has been renovated into the Henry Hotel, named after the architect Henry Hobson Richardson who designed the complex in the late 1800s. We're staying on the second floor, in a room with 15-foot ceilings . . . don't ask me what's up in those towers! For some reason -- and I don't know what it is -- the hydrangeas on Cape Cod are absolutely spectacular. B and I have a few hydrangeas in our yard at home. And they are fine. But what people grow here is a whole 'nother class of flower. Almost everyone, it seems, grows hydrangeas in their yard. The blossoms are lush, colorful and plentiful. Another popular thing to do on Cape Cod is decorate the mailbox . . .
with flowers, birds and other designs. And as you might predict, some people decorate their mailbox with pictures of hydrangeas. But, of course, the main reason to come to Cape Cod in the summer is the beach. Here is the beach at the end of our street, which deadends at Nantucket Sound. Yesterday B and I drove down to Falmouth and rode our bikes along the Shining Sea Bikeway, which runs some 11 miles from North Falmouth to Woods Hole. We've done this before --- it's one of our favorite rides -- but as usual we only did the section from downtown Falmouth to Woods Hole, about four miles (then four miles back). 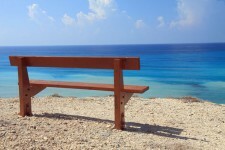 On the way we pedaled past Surf Drive beach, which offers a panoramic view of Martha's Vineyard across Vineyard Sound. Then we came into Woods Hole, a tiny little town with one main street featuring shops and restaurants. But Woods Hole is also famous for marine research. The National Oceanic and Atmospheric Administration (NOAA) has a facility here. The University of Chicago sponsors a marine biological laboratory. There's also the Woods Hole Oceanographic Institution, the Science Aquarium and a U. S. Coast Guard center. The Atlantis is one of the research ships. Woods Hole is also a gateway to Martha's Vineyard. People board the ferry for a 35-minute ride over to the island of rich and famous, where one-percenters buy homes for an average price north of $1 million. At the end of the day (being neither rich nor famous) we stacked our bikes on the back of the car, drove home and barbecued some hamburgers. Then we walked down to Main Street in Harwich Port for the music stroll, held once a week during the summer, which features bands playing up and down the street or on a little lawn in front of a shop. Alas, even for retirees, vacation must end. Tomorrow we set off on a new journey, driving 530 miles due west for another adventure . . . I got a new camera for my birthday, a Canon SX730, and so I've been taking some pictures here on Cape Cod. This first one represents two favorite activities on the Cape -- boating and relaxing. Sometimes it's a little misty by the seashore, especially in the morning. This is a bed-and-breakfast located a block or so form Nantucket Sound. And then down on the beach . . . There are some pretty impressive homes on the waterfront. I think this one is owned by someone from the Boston Red Sox. But not all homes on the Cape are so grand. This one is certainly nice enough, but a little more down-to-earth. Here we are, back in town. Bonatt's is the local bakery that offers the Meltaway, its signature pastry with a nutmeg glaze. Down the street is the locally famous Sundae School ice cream shop . . .
Last night we went to see the Cotuit Kettleers play the Chatham Anglers of the Cape Cod baseball league. The players are top college prospects from all around the country, testing out the competition for moving up to professional baseball. Cotuit beat Chatham handily, 12-3, and has three players (one from Duke, one from UCLA, one from Wright State) going to the all-star game this weekend. Meanwhile, I told you about the guide to Naval signal flags that's posted on the wall here at the house we're renting. So, can you figure out what this sign says? We went over this on a previous visit to Cape Cod, but honestly, I need an update on seashore nomenclature. We were sitting on the beach, staring out across the water of Nantucket Sound, when suddenly someone piped up, "What is a sound, anyway? What's the difference between a sound and a bay?" So that begs the question: What is a cape? 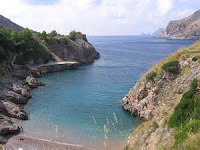 It is a large and often long headland or promontory that extends into a body of water, often the ocean. 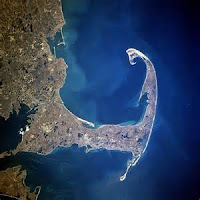 In the case of Cape Cod, the land was formed by the southernmost terminal moraine of the Laurentide Ice Sheet (which also carved out the Great Lakes) some 20,000+ years ago. The same process also gave us Martha's Vineyard, Nantucket, Block Island and Long Island. So there you have it . . . why, you can almost believe you've been at the seashore for a couple of weeks yourself! We have planned this vacation in Cape Cod, MA, since January -- that's how far in advance you have to book in order to get a place that you really want. On our way here we were able to stop and see the wife of my friend who died . . . his widow now. B and I were talking in the car along the way, and we wondered whether we were visiting her for her benefit, or ours. We didn't even know precisely why we were going. We just knew we had to. We had a very nice afternoon with his wife and daughter as they showed us around their new condo complex (It's not officially a 55-and over community, she told us, but everybody who lives here is over 55). We reminisced about my friend, and she retold the story of how they first met at a meditation seminar, back in 1974. And then B and I continued on to Cape Cod. Or, as I talked about in my July 6 post "Singing Past the Graveyard" we moved on with our lives, which we do as human beings. Or as the singer said about Clementine . . . I guess maybe I feel a little guilty about moving on with my life. But I have to say, after agonizing over a multitude of decisions we confronted when moving and unpacking and settling in to our new place, it feels nice that today our weighty decisions involve whether we go to the Sea St. beach or the Bank St. beach. Do we go over to The Port for dinner, or get some corn on the cob and clam chowder and eat at home? The house we're renting belongs to a former captain in the U. S. Coast Guard Reserve. There is a lobster trap on the ceiling, a ship's captain's table in the living room, a map of Cape Cod shipwrecks on the dining room wall. The pillows have pictures of sailboats on them; the bedspreads are festooned with anchors, the bookcase is filled with titles like Tales of the New England Coast. 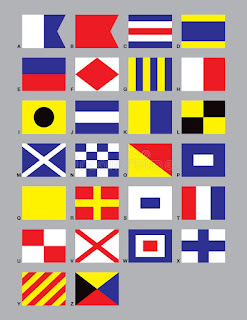 There is also a guide to International Naval Signal Flags on the wall, and so last night and this morning I've been learning the signal flags. I'm doing this from memory, so correct me if I'm wrong . . .
... and I'll learn the rest of them for next time. Ahoy there! I'm usually a pretty upbeat guy, looking at the bright side, enjoying life, approaching the world from the humorous side. Why then, suddenly, was my last post a morose reflection occasioned by the song "Oh My Darling, Clementine"? At about the same time as I was writing that post, a few days ago, and unbeknownst to me, a good friend of mine suffered a massive heart atttack. He died almost instantaneously. He was just 65 years old. I didn't find out about it until two days later. So was I having some kind of premonition that something like this might happen? I know many people our age have lost spouses, friends, even children. It's a shock to the system and, honestly, I just don't know how to respond. We all know we're going to die. But when it happens to someone, to someone we know and love, we are literally at a loss. My friend knew he lived an uncertain life. Both his parents died when they were in their 60s. When he was younger he was heavy, and he smoked. He had a heart attack when he was in his 40s. He used to joke that he'd suffered his attack about a year after he'd given up smoking . . . as though perhaps that was the reason. He lost weight, took better care of himself, never had another heart episode. But he signed up for Social Security as soon as he was eligible. There's no reason for me to wait, he commented archly. That would make a bad bet. Yes, he had a dark sense of humor. B used to call him Eeyore, because he had a rather jaundiced view of life. We'd worked for the same company for a number of years, and he worried about getting laid off for . . . well, for most of the time he was employed there. Then he finally did get laid off. But by then he had built up a pretty good retirement account for himself, and his wife had gone back to work, so financially he was pretty well off. We'd worked together on occasion. We played golf together and we played poker together. And he used to throw great July 4th parties. He had a pool in his backyard, and we'd go swimming and hang around the deck, and then he and another friend would set off fireworks. He never burned down his house . . . although he did worry about it in his own way. He liked to read books. He listened to 60s and 70s music. He watched the BBC and liked British humor. He had a collection of canes. He sold his house only about a month ago and moved with his wife to a retirement condo on the water, near where he grew up around Boston. But it was also two states away from where they'd been living for the past 35 years, and two states away from their two grown daughters. His younger daughter is working and has a boyfriend. His older daughter is also working, and is married and just recently announced that she's expecting a baby. It's sad to think he will never see his grandchild -- just missed it by a few months. I don't know what his widow will do. Stay where she is? Go back home? She probably doesn't know herself. She's in shock, even more than the rest of us. And so for now, at a loss for words, all I can say is: Goodbye Joe. When I was younger I couldn't imagine the world going on without me. I guess I couldn't imagine that I would actually die, either. But if I ever did, I figured the world -- or at least the world as I knew it -- would end along with me. Of course now I'm older and wiser. I'm still in denial about my own death (okay, you can stop laughing). But now I can imagine the world going on after I'm gone. Maybe seeing our children as adults gives us some glimpse into the future -- a future without us. I don't mean to burden you with a morbid or macabre post. But the thought entered my mind during a July 4th celebration at our local park. There was a bike parade, a tug-o-war, a cake walk, a dog exhibition, as well as plenty of hot dogs and hamburgers and snow cones and cotton candy. There was also a music tent featuring a brass band playing patriotic songs and a husband-and-wife team playing old Irish ditties and American standards from Steven Foster, George M. Cohan and others. Then the duo sang "Oh My Darling, Clementine" written in 1884 and attributed to one Percy Montrose. It's such a familiar song, although not one I'd heard in years. In decades. Not since I was a kid. B and I wondered why the song is so ingrained in our minds. Was it a song we learned at camp? A lullaby sung to us by our mothers? We didn't know. But we listened to the lyrics as the duo sang . . .
Fell into a foaming brine . . . But alas, I was no swimmer. So I lost my Clementine . . .
Fertilized by Clementine . 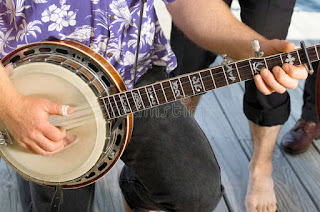 . .
Of course, the audience laughed at the end, as the banjo player winked and said, "Betcha don't remember that last line, do ya? Or maybe you just never got that far in the song." The song sounds like a lullaby, but is actually a parody of the usual sweet, sentimental song. And we sang it to our babies?!? Now it makes us laugh. It also reminds us that one day we, too, will be lost and gone forever, off to fertilize roses and other posies. But life continues, people forget, and the world moves on without us. We finally and irrevocably moved last week, leaving on June 22 and arriving on June 23. Two days which will live in ... well, in our memory ... as we suddenly and deliberately pulled up stakes and planted them anew in a foreign land. Or to put into more practical terms. We put everything we own in boxes. Moved the boxes. And now we have a house full of boxes. And we are no longer residents of New York, or Connecticut. We now belong to Pennsylvania, the Keystone state. As we get ready to celebrate July 4 we may recall that Pennsylvania is known as the Keystone state because it was the middle colony of the original 13, and it held a key position in the economic, political and social development of the United States. Some of our most important documents were written in Pennsylvania: the Declaration of Independence and the Constitution. And later, the Gettysburg address. Oh, what do you suppose is behind this door? But honestly, so far we have not experienced much of Pennsylvania. We have strolled into town several times to sample a few of the local restaurants. Earlier this week B's brother and his wife stopped by on their way home to Massachusetts from North Carolina. The four of us prowled the streets to discover a key ingredient to any top retirement destination: a good ice cream shop. The next night B and I walked down to the restored arthouse theater to see Beatriz at Dinner (an ambitious but somewhat disappointing movie). But now it's back to reality. We're spending the long weekend unpacking boxes. What are you doing for the Fourth?